There are nearly 3.1 million registered nurses in the United States; 2.4 million of them are employed according to the ANA and every year, we celebrate and honor these nurses. The celebration begins on May 6, which is National Nurses Day and ends on May 12, Florence Nightingale’s birth anniversary. According to the Bureau of Labor Statistics RNs top the list of the 10 occupations with the largest projected job growth in the years 2002-2012. Although RNs have listed among the top 10 growth occupations in the past, this is the first time in recent history that RNs have ranked first. There are over 240,400 advanced practice nurses in the United States. Of these, approximately 144,200 are nurse practitioners, 69,000 are clinical nurse specialists, 14,600 are both nurse practitioners and clinical nurse specialists, 13,700 are nurse midwives, and 32,500 are nurse anesthetists. The nation’s nurses rank first for their honesty and integrity, with 82 percent of Americans rating them “high” or “very high,” according to a 2005 Gallup Poll. Nurses have consistently rated first every year but one after being added to the list in 1999. Research indicates that advanced practice registered nurses can provide 60 to 80 percent of primary care services as well as or better than physicians and at a lesser cost. 49 states and the District of Columbia allow advanced practice nurses to prescribe medications. The January 5, 2000, edition of the Journal of the American Medical Association (JAMA) reported the results of a study which revealed patients fared just as well when treated by nurse practitioners as they did when treated by physicians. The link between adequate and appropriate nurse staffing and positive patient outcomes has been shown in several ANA publications and studies, including ANA’s Nurse Staffing and Patient Outcomes in Inpatient Hospital Settings. This report, published in May 2000, found that shorter lengths of stay are strongly related to higher RN staffing per acuity-adjusted day and that patient morbidity indicators for preventable conditions are inversely related to RN skill mix. Nurses week gifts, give-aways and commemorative T-shirts are just a few ways to celebrate this week and honor nurses. I am so proud and honored to be part of this noble profession. I appreciate the gifts, luncheons, and t-shirts but most important to me is the simple “thank you” from my patients, colleagues and co-workers. Happy Nurses Week!!! 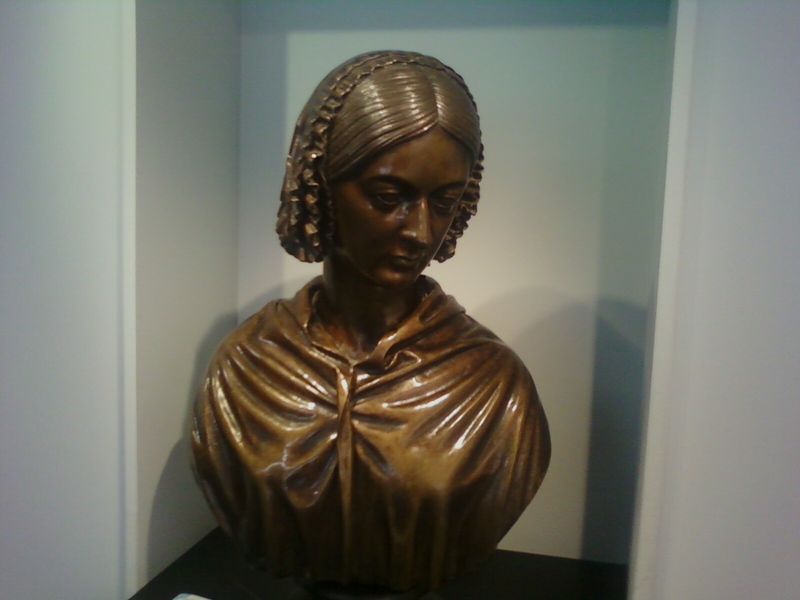 I think celebrating and honoring nurses should be all year round but on this special week, let’s not forgot to “thank-a nurse”…..
Florence Nightingale bust at the Florence Nightingale Museum, London – photo taken by @infusionnurse. May 6 – Happy Nurses Day!